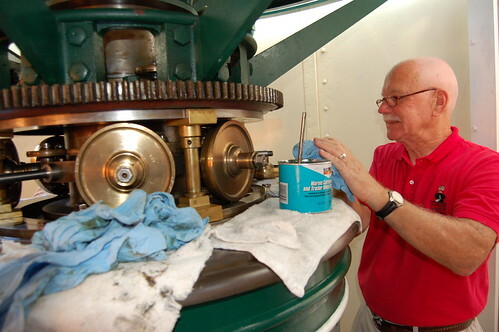 A few weeks ago we performed quarterly maintenance on the rotation mechanism. Accompanying our team was a new volunteer at the lighthouse, Dave Reed, who just happens to be the great-grandson of Head Keeper William A. Harn. 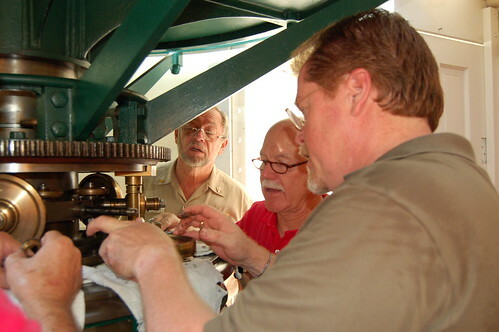 Dave Reed gets to put his hands on some of the same equipment his great-grandfather took care of 120 years ago. Keeper Harn was the Head Keeper here from October 11, 1875 to April 30, 1889, and was the first Keeper to make his home in the new Keepers' Quarters, the large brick duplex located directly east of the current tower. He was the first Keeper to wear a uniforn, as they were required in the 1880's by the Lighthouse Board to "aid in maintaining its discipline, increase its efficiency, raise it tone, and add to its espirit de corps." 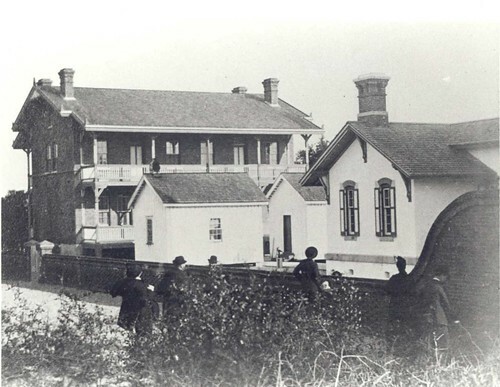 Victorian Era photo of the way the Lighthouse property probably appeared at the time. Harn witnessed the final collapse of the old lighthouse in 1880. 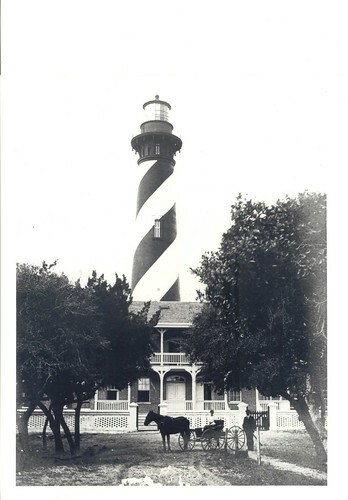 In 1886 he also saw the beginnings of development on Anastasia Island, as the area surrounding the lighthouse property became one of Florida's pioneer beach communities. Photo of the Keepers' Quarters prior to 1880. Notice the absence of the brick summer kitchens. He was here when Henry Flagler, Standard Oil magnate, began to develop St. Augustine as "the Winter Newport." Harn, a native of Philadelphia and a Major in the Union Army during the Civil War, died of consumption in his mid fifties in 1889. His widow Kate became the second woman on the lighthouse payroll when she was appointed Second Assistant Keeper after her husband's death. She held the post for over a year before returning to her native state of Maine where she lived until her death in 1927. Here I show Dave the finer points of inspecting and greasing a spindle and re-assembling the friction roller. Maintenance worker Rich Mikola looks on from just beyond Dave and Paul Eckstein is out of the picture to my left. Our volunteers are an indespensible part of our team here and the addition of Dave and his wife Jan who helps all over the site is in the best traditions of lighthouse keeping. If you are headed this way look for Dave on site. When he isn't helping me in the rotation room he is staffing the tower and base teaching visitors about our history. What a great post, Rick. I didn't know that Dave had a direct family connection to the Lighthouse--very cool! I like the historic photos too. I am working with Westport Maritime Museum on preserving their 1st order lens from Destruction Isl. off the Washington Coast. Any documented information would be helpful. Big question is what type of snake oil do you use to lube the wheel track of the chariot is it a EP extrime pressure rated oil.